A report from Korea's Asiae website states that Samsung plans on revealing next week how its long awaited foldable phone will operate. But the company will disappoint those who were hoping to see a working version of the phone surface at the company's Developer Conference. Instead, Samsung will display the differences in the UI it uses for its regular phones and tablets, and the one it has developed for the device that has now been dubbed the Samsung Galaxy F. Today's news was announced by Samsung executive Lee Kyeong-tae, who mentioned it during the company's conference call pertaining to Sammy's Q3 earnings report. 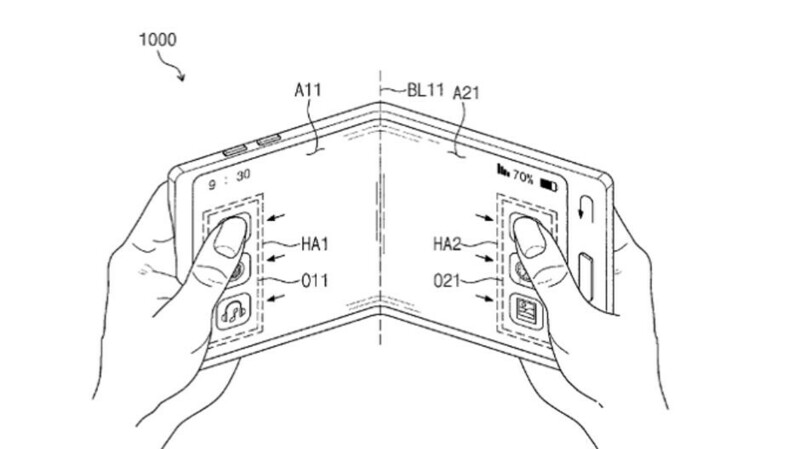 Samsung has reportedly been working on a unique UI for its foldable device. The new design is necessary to take advantage of the Galaxy F's design. Also being developed in conjunction with Google is a special version of the Android OS for the foldable unit. Samsung is said to be considering a final design between two prototypes it is believed to be considering. One is longer horizontally when the screen is unfolded (see image at the top of this article), and the other is longer vertically. A 4-inch external display allows users to have access to emails, notifications and messages without having to unfold the unit. Just this week, we learned that the in-display fingerprint scanner expected to be used on the Galaxy S10 will not be a feature on Galaxy F.
The company still has no release date in mind, although many expect that Samsung will reveal the device to the public at January's Consumer Electronics Show in Las Vegas. The Galaxy F is expected to feature an "Infinity-V" display. As we told you yesterday, the manufacturer has just trademarked that name in South Korea.